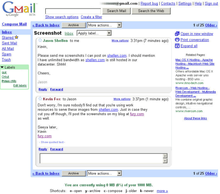 ^ "Send attachments with your Gmail message". Gmail Help. Retrieved October 27, 2018. ^ Schoon, Ben (March 19, 2019). "Inbox by Gmail officially shuts down on April 2nd, 2019". 9to5Google. Retrieved April 3, 2019. ^ "Gmail 'not working' as thousands complain about mysterious 'Error 404'". The Irish Sun. January 29, 2019. Retrieved January 29, 2019.